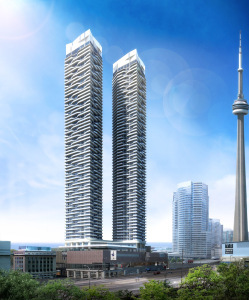 Menkes Developments is in the pre-construction phase of two condominium towers (65 and 69 storeys, 1426 units) located at 90 Harbour St, in Toronto’s Harbourfront neighbourhood. Harbour Plaza will establish a new standard for environmentally sustainable development by pursuing LEED® Platinum certification under the internationally accepted Leadership in Energy and Environmental Design program. The LEED® rating system recognizes excellence in the design, construction and operation of green buildings. Suites range in size from 329 sq ft to 1121 sq ft, and are starting in the mid $200’s. Features include a grand two storey lobby, direct connection to the PATH, 8’6″ ceilings, laminate flooring, custom-designed kitchens by Cecconi Simone with quartz countertops, stainless steel appliances and under-mounted sinks. Amenities wil include an indoor pool, gym, juice bar, Yoga studio, theatre lounge, business centre, outdoor terrace, poolside lounge, games room, party room, and a 24 hr concierge. VIP agent sales are underway. Estimated occupancy in May 2018.